Videogames aren't just for hard rock anymore. On June 24, The PIxies's alt-rock classic album Doolittle will be available on the Rock Band Music Store. The announcement was made today by Harmonix and MTV Games. The Pixies's Doolittle album hits Xbox Live on June 24 and June 26 on PlayStation Store. This album pushes Rock Band'sonline catalog to more than 200 songs, with over 12 million tracks downloaded worldwide. The 14-track album includes the hits Silver, Monkey Gone To Heavenand Here Comes Your Man. Each track will be available for $1.99 per track or $18.99 for the whole album. 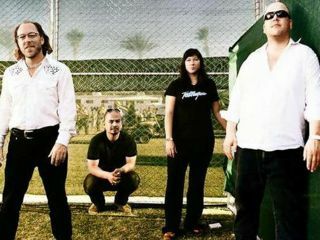 Notably, The Pixies's Wave Of Mutilation was included in the original release of Rock Band.